1. 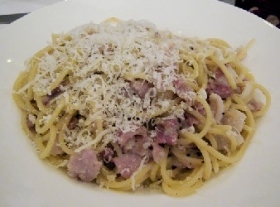 Well, probably you don't want to see any more Carbonara recipes, but I can't resist offering my favourite. 2. I have this almost once a week -- it is like a comfort food. 3. I've tried it with and without cream, and prefer it this way (without). 4. 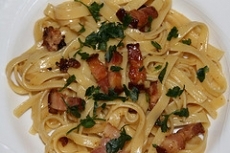 I have never been able to find pancetta, but I did have carbonara in Florence and Venice when I was in Italy last year, and didn't find a significant difference between whatever they used and the bacon I use. 5. It does pay to get a good brand of bacon, though. 6. The most important thing when making it is to beat the eggs VERY well. 7. If you can find peewee eggs in your area, one egg will be the right amount for one person -- useful if you live alone. 8. A small egg is OK too, but peewee is better. 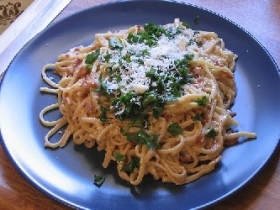 Place the bacon and chopped garlic in a large skillet with the olive oil. 9. Add the hot peppers. Cook on low heat for 12 to 15 minutes until all fat is rendered and the bacon is browned. 10. Beat the eggs in a bowl with the cheese. Cook the spaghetti in boiling salted water for about 12 minutes. 11. Drain and place in a serving bowl. Quickly spoon over the bacon mixture. 12. Toss. 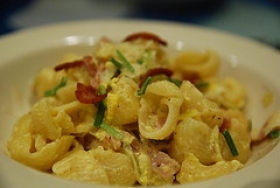 Quickly stir in the eggs and cheese. Add some salt, lots of pepper and toss well. This recipe contains potential food allergens and will effect people with Wheat, Egg, Gluten, MSG, Cheese, Garlic, Hot Pepper, Beef, Olive Oil allergies.